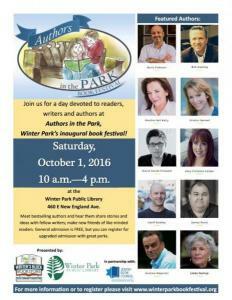 This October, bestselling authors and screenwriters from across the nation will gather in Winter Park for the first annual Authors in the Park book festival. Mary Gail Coffee of the Winter Park Public Library said that the Authors in the Park book festival will celebrate Orlando’s love of literature on Oct. 1 at the library. Sponsored by the library, the Jewish Book Council and Writer’s Block Bookstore, the festival will consist of panel discussions, Q-and-A sessions and book signings from both local and nationally-acclaimed authors from a variety of genres. Lauren Zimmerman, owner of the Writer’s Block Bookstore in Winter Park, said that the upcoming festival is a joint effort to foster a greater literary culture in Orlando. Both Coffee and Zimmerman believe the festival will be the first of many to come. General admission is free with priced packages for reserved seating. For more information, visit winterparkbookfestival.org. Two of the event’s featured authors, Boris Fishman and Andrew Nagorski, gave the Observer a preview of what they can expect from their talks at the upcoming festival. Boris Fishman tells the story of an adoptive mother and her feral child as they search for the child’s biological parents in his second novel, “Don’t Let My Baby Do Rodeo.” Fishman said “Don’t Let My Baby Do Rodeo” allowed him to explore new perspectives on curiosity, empathy and goodwill. Fishman will be answering questions about his second novel, “Don’t Let My Baby Do Rodeo,” at the festival’s 10:45 a.m. session. The session also features Martha Kelly and Kristin Harmel. Andrew Nagorski chronicles the lives of the men and women who tracked down all-but-forgotten war criminals in “The Nazi Hunters.” Nagorski said that he wrote the book to honor their effort to achieve some measure of justice after the war. Nagorski will speak more about “The Nazi Hunters” at the festival’s 3 p.m. session. The session also features WESH Channel 2 investigative reporter and author Bob Kealing.